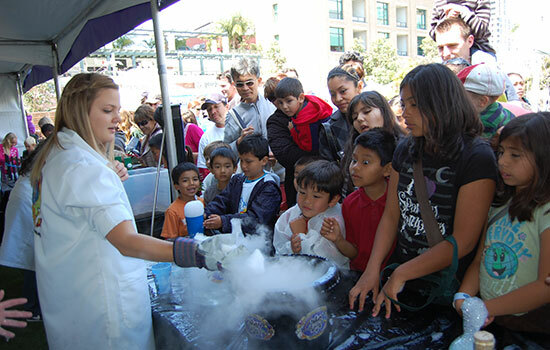 Image courtesy of the San Diego Science and Engineering Festival. The Atlanta Science Festival is a weeklong celebration of local science and technology. Atlanta residents and guests of all ages will have the opportunity to explore the science and technology in our region and see how science is connected to all parts of our lives. Scientists and educators from museums, local schools, universities, and companies will uncover mysteries and explain discoveries in a range of hands-on activities, facility tours, stimulating presentations, and riveting performances to expand our community of science enthusiasts and inspire a new generation of curious thinkers. Founded by Emory University, the Georgia Institute of Technology, and the Metro Atlanta Chamber, the festival is a collaboration of more than 80 community partners planning a series of events for young people, families and adults. The week’s events will culminate Saturday, March 29 at Centennial Olympic Park with a family-friendly, all-day Exploration Expo offering non-stop, big-bang activities; out-of-this-world experiments; pop-up interactive exhibits; mind-bending games; and a full lineup of science-oriented live entertainment. The Exploration Expo is open to the public from 11:00 a.m. to 4:00 p.m., and admission is free. 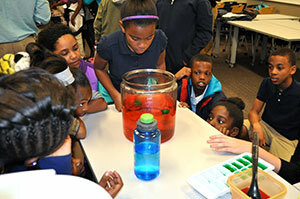 Children from Centennial Place Elementary School learning more about science. Called “the biggest interactive science event Atlanta has ever seen,” the Atlanta Science Festival Expo will feature nearly 100 exhibits and demonstrations from community groups such as Young Women in Bio and Atlanta Makers to entities such as Delta Air Lines, Coca-Cola Company, Zoo Atlanta, Centers for Disease Control & Prevention, and local colleges and universities. Meisa Salaita PhD, festival co-founder, has long been impressed with the robust science and technology industry in Atlanta as the Director of Education, Outreach and Diversity for the NSF/NASA Center for Chemical Evolution. “One of the goals of the Atlanta Science Festival is to encourage local organizations invested in STEM education, research and innovation to work together to excite our community about science,” says Peterson. “There are many ways to get involved in the Atlanta Science Festival. We are looking for collaborators, sponsors, volunteers, and of course, participants." Financial sponsors of the festival include the founding partners plus Mercer University and Mercer Health Sciences Center, the NSF/NASA Center for Chemical Evolution, Delta Air Lines, AT&T Mobility, Georgia State University, Georgia Power, Lockheed Martin, Coca-Cola Company, Kennesaw State University, NSF Center for Selective C-H Functionalization, and several others. For more information on the Atlanta Science Festival and its activities, please visit http://atlantasciencefestival.org/events.